The bride's hands are covered with decorative patterns inked in henna, the groom is perfumed and the guests feast and dance the night away in a colourful tent. In most ways, the happiest day of Shofika Begum and Saddam Hussein's lives mirrors that of couples getting married the world over. 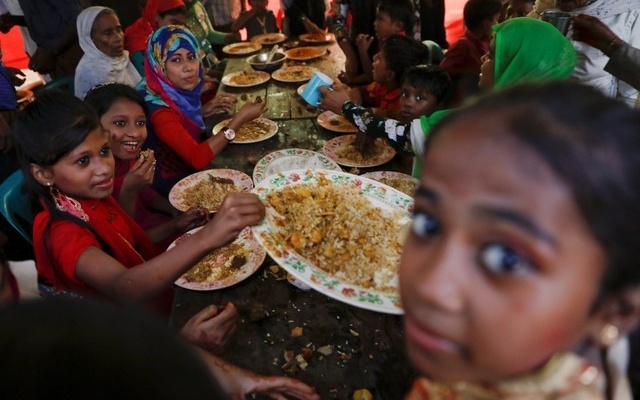 The big difference is where the two are living and celebrating their wedding - at Kutupalong refugee camp, one of several sprawling settlements of bamboo poles and plastic sheets in Bangladesh's Cox's Bazar district, where about 660,000 Rohingya Muslims from Myanmar, most of whom are stateless, have sought refuge since late August. 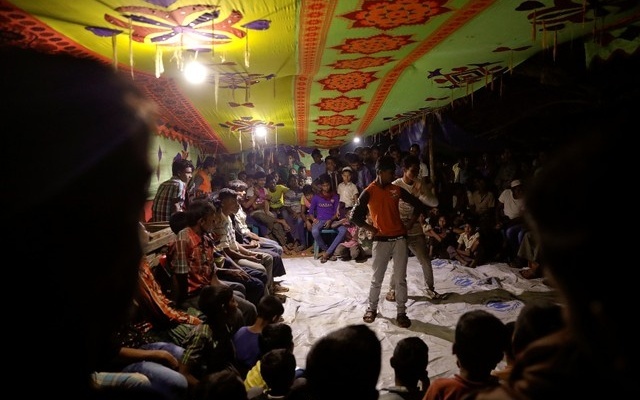 Rohingya militant attacks on Myanmar security forces on Aug 25 triggered a brutal Myanmar counter-attack that the United Nations has called a textbook example of ethnic cleansing. That, in turn, sparked what the UN refugee agency has called the world's fastest-growing refugee crisis. Myanmar's military says the crackdown was a legitimate counter-insurgency operation, exonerating its security forces of all accusations of atrocities in an internal investigation. Both the bride and groom are from Kha Maung Seik, a village in Maungdaw township in Myanmar's Rakhine State. The village is known to the Rohingya as Foira Bazar for its market of about 1,000 shops. Saddam, 23, and Shofika, 18, planned to marry even before the latest violence. Saddam, whose family were shopkeepers in Myanmar, said they fled after military forces burned their homes. He lost touch with Shofika for a couple of weeks during that chaotic period, but they were reunited in Kutupalong camp. Three months later, they are celebrating their wedding. 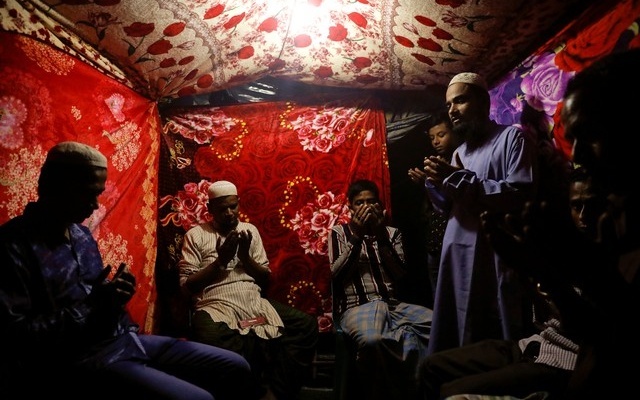 A Muslim cleric officiates the prayers and performs the religious ceremony to marry the couple in a small tent decorated with blankets in vibrant patterns. Only men attend this ceremony. Shofika spends much of the wedding day in a separate tent, being attended to by female relatives. The party begins shortly after, with a large meal served in a big tent to 20 guests at a time. A cow was slaughtered the day before and a curry prepared for the feast. Men are served first, then the women sit down and lastly, the children eat. The free meal is distributed to children in plastic bags, but a scuffle that erupts means that some of it ends up in the mud. "Here, at least, we don't have to pay", Saddam says, when asked how he feels about getting married at the camp, explaining that the administrator in their village had asked for a payment of 500,000 kyat ($370) from couples wanting to wed.
After everyone has had their fill, the long tables and plastic chairs are removed, and a loudspeaker is hooked up. It's time for a dance. A professional dancer and his two assistants take to the floor with flashy moves to warm up the crowd. Soon, everyone is clapping and getting on their feet. The happiness of their wedding day belies the uncertainty that Saddam and Shofika feel about their future in the overcrowded refugee camp. "We will wait to have children," Saddam said. 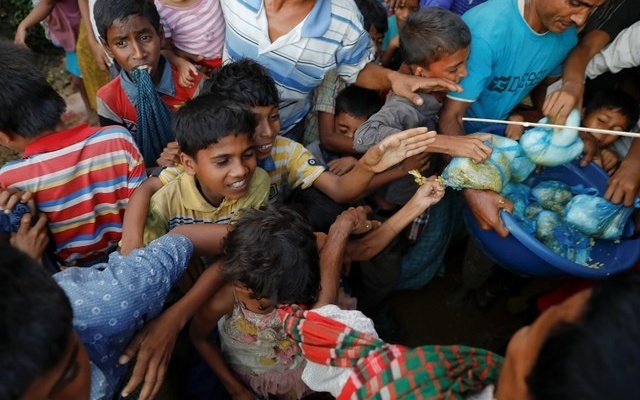 "We need to know whether we are staying here or going back to Myanmar first. I would only return if we are given Myanmar nationality."